A little bit spooky, but cool. OMG, have you tried this stuff? 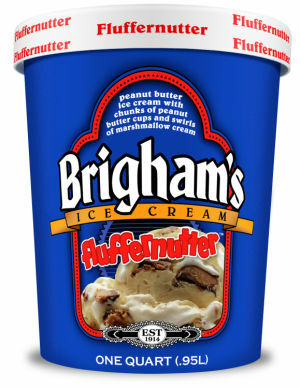 Brigham's has combined peanut butter ice cream, miniature peanut butter cups, and real Marshmallow Fluff. The result tastes like the fluffernutter sandwiches you used to make when you were a kid, only about a thousand times more awesome. This guy programmed his phone system to take incoming sales calls, and to endlessly feed them non-committal, pre-recorded, expressions of interest. The object is to take up as much of the caller's time as possible, and if possible make them insane. Link to the guys's blog entry about the scheme. ... but I almost gave up watching the monologue, which is most of part 2. I'm glad I didn't, cause the Music Man spoof that starts about 5:30 into the second clip, is surprisingly good. I've never really gotten into Rocketboom the way others (many others, apparently) have (except when Steve Garfield has a piece on the show, then it's excellent!). But last friday's ep which was all about a story of kids making claymation animantions was really great. 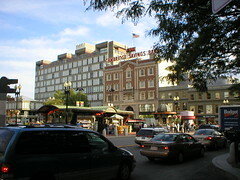 Yesterday I hopped on the train and headed into Boston and Cambridge to enjoy the great day. I took a lot of pics, and I've posted them as a "set" on Flickr (link). I just spent the better part of an hour searching You Tube for a performance to present as a counterpoint to this classic by Stevie Ray Vaughn. I couldn't find anything. Clapton, Beck, Santana, Buddy Guy, Dr John. All awesome musicians, but I couldn't find anything that I wanted to put next to this performance of Texas Flood. Earnest/Jack: "Well, really, Gwendolen, I must say that I think there are lots of other much nicer names. I think Jack, for instance, a charming name." Gwendolen: "Jack?... No, there is very little music in the name Jack, if any at all, indeed. It does not thrill. It produces absolutely no vibrations... I have known several Jacks, and they all, without exception, were more than usually plain. Besides, Jack is a notorious domesticity for John! And I pity any woman who is married to a man called John." "When the winds of change are blowing, some people are building shelters, and some people are building windmills." GEWF pal Jo Ann and I should meet-up in NYC for this event. ... We have an amazing line-up of distillery managers and master blenders from Scotland, Ireland and the U.S.
More than 250 of the world's finest, rarest and most expensive whiskies will be available for sampling, featuring the finest single malt and blended Scotch whiskies, the best bourbons and Tennessee whiskeys, top of the line Irish whiskeys, and the best from Canada. A few weeks back GEWF gang member MGA showed this to me. I want one of these planes. A couple of friends and I have started to publish a bi-weekly podcast about flying. Eventually it will have a real name, but for now it's called the "No-Name General Aviation Podcast"
Jeb Burnside, Dave Higdon, Jack Hodgson and the rest of the NNGAP gang. Every two weeks the NNGAP gang will gather to talk about all things GA. You can listen-in as some of General Aviation's most knowledgable, opinionated, and plain-spoken characters do some online, hangar-flying. Show-notes can be found at www.aroundthefield.net. You can listen to the first episode here. Eventually it should be available through the iTunes Music Store and other podcast portals. But for now you should be able to subscribe via this feed. There's a saying, that the nice thing about banging your head against a wall, is that it feels so good when you stop. Court rules President Bush broke the law. In a 43-page opinion, Judge Anna Diggs Taylor of the Eastern District of Michigan rejected that argument. She said Bush violated federal statutes and constitutional protections for privacy and free speech when he authorized the military to wiretap Americans' international calls and e-mails without court oversight, overstepping the limits of his executive power. I wonder what would happen to me next if a Federal Judge said that I, "violated federal statutes"? The guys organizing Podcamp are trying to make this event as fun, and open, as possible. They're trying to do this without becoming too beholden to commercial sponsors. If you'd like to make a cash donation to support this groundbreaking event you can do so here. Or if your organization would like to support Podcamp by being a sponsor, click here. 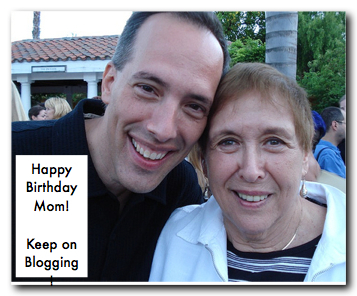 Today is SteveGarfield's Mom's birthday. This Vanity Fair article presents a riveting picture of the US military's attempts to defend the country on that terrible morning. For the NEADS crew, 9/11 was not a story of four hijacked airplanes, but one of a heated chase after more than a dozen potential hijackings — some real, some phantom — that emerged from the turbulence of misinformation that spiked in the first 100 minutes of the attack and continued well into the afternoon and evening. At one point, in the span of a single mad minute, one hears Nasypany struggling to parse reports of four separate hijackings at once. What emerges from the barrage of what Nasypany dubs "bad poop" flying at his troops from all directions is a picture of remarkable composure. Snap decisions more often than not turn out to be the right ones as commanders kick-start the dormant military machine. It is the fog and friction of war live—the authentic military history of 9/11. The online version of the article includes actual audio clips from the recorded communications that morning. I always felt that the total grounding of all civilian aviation that day was an over-reaction. Reading this it made total sense. Going out on a limb in the prediction category...for the Republicans, there's no question they've struck a deal with McCain, given his behavior and toning down of his usual forthrightness, which sadly kind of invalidates him, as far as I'm concerned. It may make him a more viable candidate, but a less viable president, if that parses. Nonetheless, he'll start this thing as a front-runner, and may even make it to the nomination, but honestly I think the nomination is Guiliani's to lose. Maybe we'll see a combination of the two. For the Democrats, barring Edwards making one heck of a comeback, I think the nominee is going to end up being somebody we haven't heard much about before, someone who's going to kind of blind-side the media and the beltway the way Clinton kind of came out of nowhere. I think we've seen the same-old-gang one time too many, and none of them have demonstrated any real strength in dealing with things in DC, so someone from the outside will, I think, be very attractive. They're doing maintenance in the middle of the day? What's up with that? Tonight we begin a three game series against the current best-team-in-baseball, the Detroit Tigers. A week ago we were pretty much unable to beat the two worst-teams-in-baseball. But no one is thinking about that now. Then, after an off-day on Thursday, we have what promises to be a mind-altering experience. A four day period when we play the Yankees FIVE TIMES. All this takes place at Friendly Fenway, where we have a better than average record, so, well, we'll see. I saw an aerobatic plane once that had this on its side: "Climb in, Buckle up, and Hang on." Melissa Etheridge & Joss Stone bring down the house at the 2005 Grammys. Janis, late in her career. For some weeks now gas prices here in northern greater-Boston and southern NH have been hovering around $2.99 up to $3.05. Over the past couple of days they even seem to have dropped a penny or so. I don't understand it. A year ago, the damage, by Hurricane Katrina, to the oil and gasoline supply caused gas prices to jump 30-40 cents in the few days right after the disaster. And it kept going up even after that. This year, we have news stories about the Alaska pipeline going off-line for months, and there's no reaction in price. The Red Sox' win this afternoon was satisfying. Together with last night's strong showing, my faith is re-strengthening. But let's be clear about one thing: The Fox Network announcer nearly wet himself with excitement about a bottom-of-the-ninth winning run. Leading up to that moment he was frothing at the mouth, hoping for one of the redsox' trademark "walk-off-hits". But that wasn't a walk-off hit. Manny did get a good clean hit single (and thus continues his impressive hitting streak). But Manny's hit did not drive in the run. The run came in on the error by the left fielder. If he hadn't bobbled the ball the runner would have been held at third. It was a "walk-off-error". Which is right up there with the "walk-off-walk". UPDATE: AP calls it a "last at-bat victory". I may give this a try sometime. But I also thought my sister's friend Don, might enjoy giving it a try. Here's a real nice collection of photos of traveling to Oshkosh from California. The page takes a little while to load, 'cause it contains a lot of pics, but it's worth the wait. Here's a quick wrap-up of the premiere dates for the shows I'm looking forward to. These dates are from tv.com. Gilmore Girls -- Tue Sep 26 8pm??? According to this story, filming for the upcoming season finished this past week. August 5, 2006 -- ...the Survivor Cook Islands television show finished filming in Aitutaki yesterday... the last and 39th day of the blockbuster reality show. The new season premieres Sept. 14. Oh, by the way, I arrived home safely. 18 driving hours. Left at 10am OSH time, arrived 2pm Boston time. It's hotter here than it was at Wittman Field! Mark’s Geekly Ramblings has also been blogging AirVenture. Scroll bac to read all his Oshkosh posts.